Our goal: to open a Spanish bank account, get a debit card with an image of the Alhambra on it – and be offered free sweets. We found a bank on Calle Doctor Fleming, here in Órgiva. Our NIEs, which we’d sorted beforehand, were needed. The English-speaking bank manager guided us through the process in about 30 minutes. It would have been better if we’d been forced to speak a little, look up vocabulary on our phones and draw diagrams on paper. But hey, his English improved a little even if our Spanish didn’t. NIE certificates, our UK address (this was a non-resident account) and passports were handed over. The embarrassing glimpse at our photos was noted. We were hungover that day, OK? A modest monthly fee was agreed to cover ATM withdrawals, internet banking and a variety of other charges – and to pay for those sweets. A live demo followed, a bit of healthcare selling on the side, and we left with a ton of paper (paperless bank, you see), having signed so many things we felt like celebrities. We learnt there were no fees to transfer funds from specialist currency companies (like Caxton and FairPay) but would be if done directly from a UK bank. Those companies take their cut, just do your sums to work out what’s best for you. We collected our debit cards a week later on market day as a…er…Scottish chap played the bagpipes outside the bank. This is Órgiva, after all. 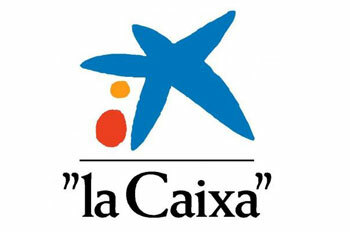 We chose La Caixa, the biggest savings bank in Europe and the third largest financial institution in Spain. Its logo, which we thought was a starfish bouncing some balls up and down, represents a child depositing a coin into a piggy-bank. Artist Miró – way down on the list of famous Spanish people, beneath Conchita Martínez – was specially commissioned to design the logo in the late 1970s. Spain’s banks are great – and this one has a peeled blue banana as a logo. I rather like the logo now that you have explained it!